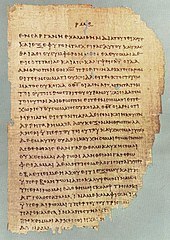 In the New Testament, the Seicont Epistle o Paul tae Timothy, uisually referred tae semply as Seicont Timothy an eften written 2 Timothy or II Timothy, is ane o the three Pastoral Epistles tradeetionally attributit tae Saunt Paul. ↑ May, Herbert G.; Metzger, Bruce M. (1977), The New Oxford Annotated Bible with the Apocrypha, pp. 1440, 1446–49 . This page wis last eeditit on 12 October 2018, at 20:22.